Join Vinny, Kayvan, Mike, and Vinnay every Thursday at 12 noon for interviews with local organizations and other PBSC student volunteers as well as discussion topics. 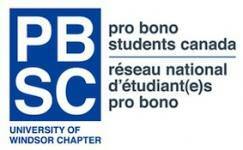 Pro Bono Students Canada matches law student volunteers with organizations in the Windsor area with a need for legal services, including public interest and non-profits. All students complete projects assigned by the orgnization under the supervision of a lawyer.